It took place in Washington Heights, NYC. One gal went to an all-girls school and was peeved that she couldn’t be around boys. One gal named Darlene already had hairy armpits and a D-cups in the fifth grade. At one point, I think in the sixth grade, they all decided they would only like boys if they were in the eighth grade or older. Eventually in high school the character dated this street kid and the whole book was basically them breaking up, making up, and making out. Also, if you want to read along; coming up: Miss Teen Sweet Valley, Regina’s overdose, and more cheerleading drama. I fricking loved these books when I was like fourteen. I’m so glad you mentioned them, because I’d forgotten the names of the series/author. Now I have to order them all. Heh. I loved these too, especially We Love Only Older Boys. The WHEEB Club ! Remember the main one was in lurve with some kid named Tony (?). Those crazy gals prank called their chosen boys at a sleepover and she told Tony’s mom over the phone in a fake Southern accent “I am in love with your son !” Ah, to be in middle school again ! @ Elaine: No, no, it was Jeff. 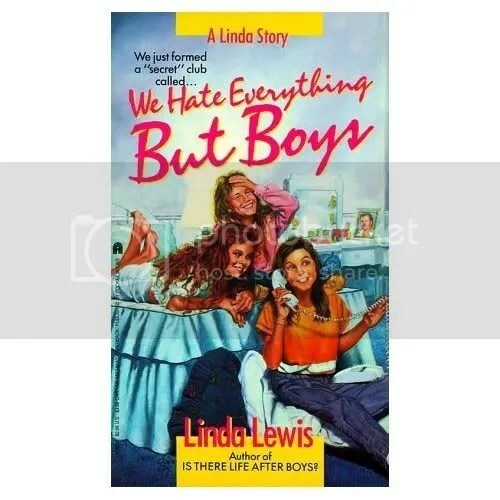 I really only remember because I read this and the next one in the series, Is There Life After Boys. I didn’t know there were more books in the series. I must go to Amazon or eBay immediately. I missed these. Boo. But I was just thinking the other day how much I loved the Fabulous Five/Taffy Sinclair books, and also the books about twins that always had some sort of food in the title (I think like the Jelly Bean Scheme or something). Sigh. Books were so much better then. @ Eli: I think you’re thinking about the Pratt twins books by Cynthia Blair. Did you ever read Marshmallow Masquerade, the one where Chris(tine) pretends to be a boy so that she can get the star basketball player (who’s even more of a tool than Todd) to ask her out? Hate, hate, HATE to do this but I’m desperate. Did anyone else read a series of books about five girls, including two twins. They rode to school on a school bus and lived in the new part of town and the “cool kids” lived in the older part of town. They were jealous of the cool kids’ room over the garage, so they found a little playhouse in the woods and were setting it up. I think “starr” may have played a part. Something something Rural Route, maybe to do with riding the bus? Oh my God, I loved those books! I even sort of wanted to live in Washington Heights for a while. Oh I can’t wait until you do Taffy Sinclair! Talk about books warping your values as a child; those taught me that it was totally normal to start a club whose entire purpose is hating another person. This makes me fear for the Gossip Girl generation. I remember Taffy Sinclair also! I remember the main character talking about the fact that Taffy had “a crooked bicuspid”. Umm…is that a reason to hate someone??? And I always wondered who the hell would name their kid Taffy. Oh YAY, I’m so glad you will be doing Taffy Sinclair. I thought maybe I was the only one who read those books. I dug it cuz I have a crooked bicuspid as well, but no one started a club to hate me (I think). Hehe. @ Melody_Gray–And YES, the Pratt twins. Thanks for reminding me. I do remember the one where Christine pretended to be a boy. Those books were so lamely fabulous. I always envied the twins’ vast array of scrunchies that they sported on the covers of the books. And their mirrored vanity. Wow. I read the WHEBB book but I didn’t know it was a series! And I totally forgot about Taffy Sinclair. I think I only read the book where she found a baby on the porch or something. It was a purple book, that’s all I remember. OMG. Can’t wait until you do the Taffy Sinclair books… and while you’re at it, how about the Fabulous Five series? The crooked bicuspid wasn’t a reason to hate Taffy–it was one of her very few imperfect features. Might have been the only one, come to think of it. I loved We Love Only Older Boys when I was in middle school. A few years ago, I was wracking my brain to remember what it was called and who wrote it. Glad I’m not the only one who remembers this series. Oh definitely the Fabulous Five. My favorite one is where they all go to the Carribbean together (cuz again, young adult novel rules dictate that groups of friends vacay together) and they are all secretly dated by this toolbox cabana lounge singer named Marco. Heh. I LOVE this site!!! It totally jogs my tween memory. I’m happy that you’ve expanded, and are including WHEEB, and potentially the Fabulous Five. You rock! I loved this series when I was younger…and wasn’t the author/narrator one and the same? Or am I making this up? 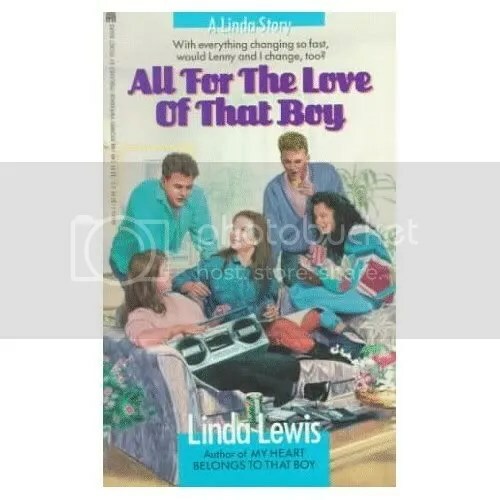 Linda Lewis was Linda the narrator…maybe? I can’t believe other people remember the Pratt twins. What about Freshman Dorm? Can we get those going? Anyone with me? Hey, I just want to say that I loveeeeeee WHEBB! I 1st read whebb back in middle school but I recently ordered it from biblio.com…The book was only $1.00***I also ordered 2 young 2 go 4 boys and is there life after boys! We love only older boys is next on my list…….Please read these books because they are awesome!!!! Can anyone tell me where I can get the entire series???? These books were based on the author’s own life and experiences growing up in Washington Heights in the 60’s. Lenny Lipoff was the actual name of her real boyfriend and she married him and they are still together living in Fort Lauderdale. Not sure anyone cares, but I thought it would be cool info to share. 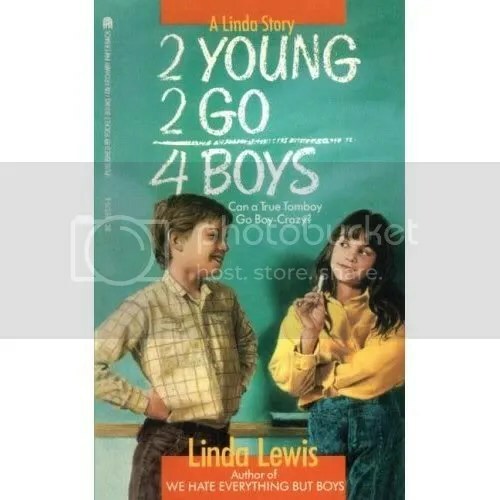 i read 2 young 2 go 4 boys in sixth grade and then I never found the series again I have been looking and looking. I want to read the whole series and I’m freaking old. I am gonna have it for my daughter. I loved these books so much. I actually had to ask on yahoo answers a couple years ago to remember the author so I could find them again. I still haven’t read them though because I got caught up in reading the Alice series by Phyllis Reynolds Naylor that I had loved as a kid. I think these are definitely gonna be next. I’m hoping to collect all of BSC and SVH eventually and reread them but that’ll probably be when I’m 60 or so.